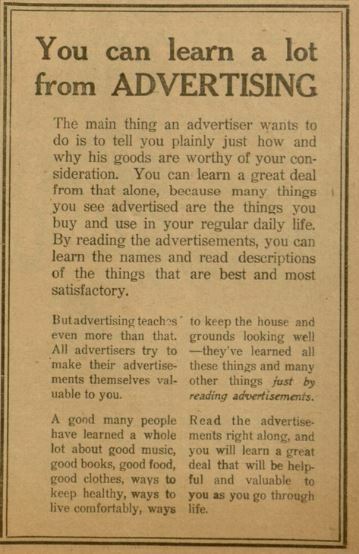 The Digital Library@Villanova University’s newest online exhibit, “You can learn a lot from ADVERTISING”: the American Paper Experience” illustrates advertised products published, in the 19th and early 20th centuries, that the average American read in print newspapers and magazines. 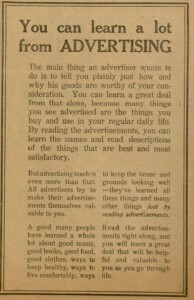 The exhibit’s title comes from a direct quote about advertising published in The Chicago Ledger, March 29, 1919, that encouraged by “reading advertisements” the decision would be informed and make the product “valuable to you as you go through life.” The advertisements for the exhibit were selected to illustrate an assortment of merchandise available to the readers between the years 1858 to 1921. The selected newspapers are from the Digital Library’s digitized collections. Among the newspapers used are: Ardmore Chronicle, (Ardmore, PA), The Chicago Ledger, (Chicago, IL), The Catholic Standard and Times, (Philadelphia, PA) and others. This exhibit was curated by Sue Ottignon with assistance from Laura Bang and Michael Foight and graphics by Joanne Quinn.